Rossini - Falliero's Aria "Tu non sai, qual colpo atroce"
Rossini - Isabella's Recitativo & Rondo "Amici in ogni evento...Pensa alla patria"
Rossini - Arsace's Cavatina "Ah, quel giorno ognor rammento"
Winner of the special Mercedes Viñas Prize in the International singing contest Francisco Viñas in2013, Victoria Yarovaya is one of the most outstanding young mezzo-sopranos to come out of Russia recently. Born in Moscow, she began studying music at 5 years old as a soloist in a well-known children’s choir and went on to win many competitions. She was awarded a scholarship from the New Names Foundation and graduated from the Academic Music College at the Tchaikovsky Moscow State Conservatory as a pianist. Her postgraduate studies were at the Opera Centre under Galina Vishnevskaya, she attended master classes given by Riccardo Muti, Mauro Trombetta, Mimi Curtsi and Irina Bogachova and joined the Academia Rossiniana in Pesaro, where she worked under Alberto Zedda. She became a soloist at the Novaya Opera in Moscow in 2009 and in the same year appeared with the Rossini Opera Festival in Pesaro as Marchesa Melibea IL VIAGGIO A REIMS and as Rosina IL BARBIERE DI SIVIGLIA with the Fondazione Pergolesi Spontini. In 2010 she returned to the Rossini Opera Festival as Demetrio-Seveno DEMETRIO E POLIBIO and in the same year first appeared with the Glyndebourne Festival. Recently she appeared as Tisbe CENERENTOLA for the Glyndebourne Festival Opera, returned to the Rossini Opera Festival in Pesaro to sing Ernestina L’OCCASIONE FA IL LADRO, appeared again in the role of Demetrio DEMETRIO E POLIBIO at the Teatro di San Carlo di Napoli, made her role debut as Hänsel HÄNSEL UND GRETEL for Glyndebourne Touring Opera and sang Dido DIDO AND AENEAS for the Novaya Opera Moscow. Her appearances in the title role of Cenerentola at Scottish Opera and at L’Opéra de Rouen recently won her great critical acclaim. She appeared at the Rossini in Wildbad Festival as Falliero BIANCA E FALLIERO gaining excellent reviews, made a considerable impression as the mezzo-soprano soloist in the ROSSINI MESSA DI GLORIA at the Rossini Opera Festival in Pesaro and sang Isabella L’ITALIANA IN ALGERI for Teatro del Maggio Musicale Fiorentino. She added the role of Pippo LA GAZZA LADRA at Teatro Petruzzelli di Bari, appeared as Rosina IL BARBIERE DI SIVIGLIA at Finnish National Opera, sang Ljubava SADKO for the Vlaanderen Opera in Gent, Calbo MAOMETTO II for Rossini in Wildbad and Isaura TANCREDI in concert version in Marseille. Among her most recent engagements are Juno SEMELE, at Gärtnerplatztheater, München, a return to ROF Pesaro for Zomira RICCIARDO E ZORAIDE; Rosina IL BARBIERE DI SIVIGLIA at Teatro Municipal Chile and Fenena NABUCCO at Opéra de Lille; and Opéra de Dijon. She will return to Chile for Isabella L’ITALIANA IN ALGERI. Giampaolo Bisanti, Marco Boemi, Andrew Davis, Antonino Fogliani, James Gaffigan, William Lacey; Jan Latham-Koenig, Yi-Chen Lin, Alessandro de Marchi, Fabio Mastrangelo, Enrique Mazzola, Trisdee Na Patalung, Kirill Petrenko, Corrado Rovaris, Alexander Rudin, Ilyich Rivas, Gennady Rozhdestvensky, Vassily Sinaisky, Alberto Zedda. Rossini Opera Festival  ROSSINI MESSA DI GLORIA; Tribute to Evgeny Kolobov, Opera and Jazz – musical; Maria Callas – musical tribute; Rossini – musical divertissement; Johann Strauss the Waltz King – gala concert; Ten Sopranos – gala concert; Old Granny’s Tales – Kaleidoscope of pictures to the music from Mussorgsky’s The Nursery and Pictures at an Exhibition song cycles; Alto solo Bach Magnificat and Mendelson's Lobgesang at the Moscow Tchaikovsky Concert Hall; Alto Solo DVOŘÁK REQUIEM MASS at the Great Hall of Moscow Conservatory. Rossini DEMETRIO E POLIBIO (DVD), role: Siveno - Rossini Opera Festival 2010. Rossini BIANCA E FALLIERO (CD), role: Falliero - Rossini in Wildbad Belcanto Opera Festival 2015. Victoria Yarovaya is terrific as Cenerentola, with a velvet low register and dazzling coloratura to boot. It's worth sitting through this production for her final scene alone. 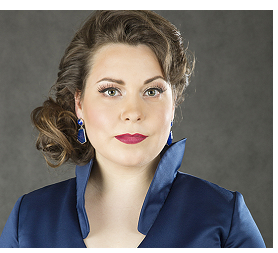 The best voice on stage, by a mile, is that of young Russian mezzo Victoria Yarovaya in the title role, and she is undoubtedly a talent to watch. Victoria Yarovaya was quite magnificent as Angelina (La Cenerentola), soaring from sobbing sadness to the heights of coloratura contralto as the day arrived when her prince did come. Even the evening's lone star, the Russian mezzo-soprano Victoria Yarovaya in the title role, is herself transformed from this point on. She fires off glowing roulades in the finale, having opened the evening a little cautiously. Yet, right from the start her velvety tone goes well with the character's melancholy, and she is undoubtedly a name to watch. First and most crucially there seems to be only one singer on stage with anything like the vocal power and technique to ping Rossini's quicksilver coloratura to the back of the dress circle - and that is the young Russian mezzo Victoria Yarovaya in the title role. After a slightly untuneful start, she gets better and better, culminating with a storming number at the final curtain. And her transformation from downtrodden Cinders to radiant princess is joyously managed. Her performance accurately tracked the development of the character she was portraying, blossoming in the finale with a knock-out account of Rossini's demanding climactic aria. Son amoureux, antepénultième rôle en travesti, a été confié à Victoria Yarovaya, dont Brigitte Cormier avait loué ici-même la Cenerentola de Rouen. Que dire ? Ce n’est pas facile quand on est bouche bée devant une agilité torrentielle façon Bartoli et une extension vocale digne de la Horne. On reste médusé par la sûreté avec laquelle elle monte et descend les échelles vocale, enchaîne trilles, ports de voix et lance avec arrogance des éclats qui se résolvent sans couture en piani d’une suavité qui grise. Ses da capo sont des tourbillons vertigineux et cette détermination vocale va en outre de pair avec un aplomb scénique qui ne laisse rien à désirer. Comment lui résister ? Le public explose à la fin de sa grande scène de l’acte II. Gesanglich gehört die Komposition zu den traditionelleren mit groß angelegten Nummern und höchsten virtuosen Ansprüchen. Die umjubelte Entdeckung der Besetzung heißt Victoria Yarovaya – ein ungemein tonumfangreicher Mezzo, der mit natürlich klangvoller und pastoser Tiefe über eine gut sitzende Mittellage sowie einem idiomatisch in die Gesangslinie eingebundenen Spitzenbereich alle nur erdenklichen Ausdrucksparameter an expressiver Rollengestaltung ausschöpft und durch ihren entflammt lebhaften Einsatz über die für eine Hosenrolle etwas unglückliche Figur hinweg sehen lässt. Yarovaya begeistert als Falliero mit einer samtig weichen Mittellage und großartigen dramatischen Ausbrüchen in den Höhen. Einen Glanzpunkt des Abends bildet ihre Arie im zweiten Akt "Tu non sai qual colpo atroce", in der Falliero sich aufgegeben hat, weil er glaubt, dass seine Geliebte Bianca den Rivalen Capellio geheiratet habe. Wie Yarovaya sich dabei gekonnt durch die schnellen Läufe bewegt und dabei die Töne sauber ansetzt, ist beeindruckend. Genau diese stilistische Wandelbarkeit besitzen auch die durchgängig hochklassigen Sänger, unter denen Victoria Yarovaya (Falliero) mit ihrer subtilen Virtuosität und Kenneth Tarver (Contareno) mit seiner seidigen Tenorstimme noch herausstechen. Yarovaya singt mit feurigem Zugriff und strahlender Brillanz, manches ist auf die Dauer etwas monochrom, technisch lässt sich das eine oder andere auch noch etwas nachbessern. Die Sopranistin Cinzia Forte und ihre Mezzo-Kollegin Victoria Yarovaya durchmessen ihre vor Koloratur-Rouladen strotzenden, schier abartig schwierigen Partien auf fulminante Art. Più centrata ed interessante invece Victoria Yarovaya nei panni di Falliero: l’elegante personalità ed un buon senso musicale le hanno consentito di sopportare un contesto esecutivo poco favorevole ed offrire almeno una persuasiva interpretazione della cavatina «Se per l’Adria»; più insidiosa invece la grande scena delle catene del secondo atto, la cui riuscita può però sempre contare sui sublimi trasporti della musica di Rossini.